Hello readers! I've been very busy recently, with a lot of time at the office for my current project and traveling most weekends to places around Korea. It has been exhilarating, but frankly I need a restful weekend to catch my breath. More on the Korean travels to come in another post. 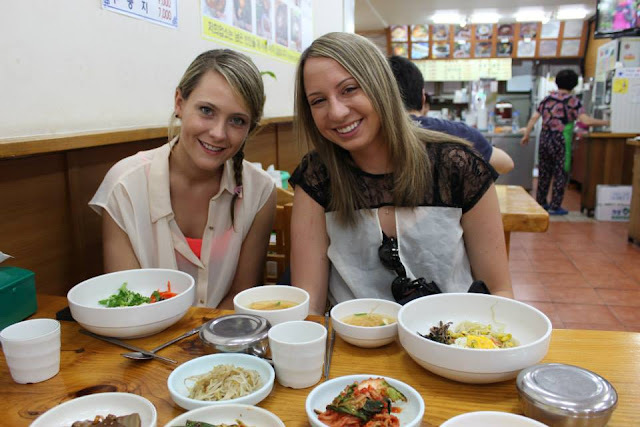 My weekend Korean travels took a break 3 weeks ago when my sister Jillian visited Seoul. 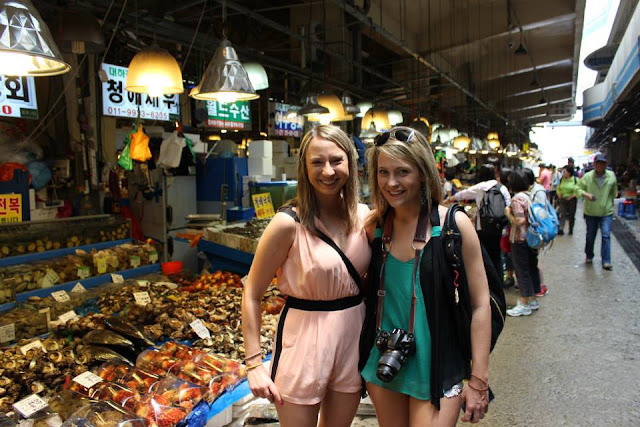 My sister has traveled extensively throughout Europe but had never been to Asia before. She graduated from Virginia Tech last month and I couldn't come back to the USA for her ceremony, so instead I told Jillian that she could visit me in Korea as a graduation present. She jumped on the offer and grabbed a friend to fly with her halfway around the world to visit. I was happy she was traveling with a friend because I wasn't able to take time off from work to show her around and this way she would have someone who could merrily get lost with her together in Seoul. Fortunately, Jillian was just grateful to see her brother in his new environment and didn't have high expectations for things to do here. This was good because, frankly, Korea generally doesn't have many "must-see" attractions. Hence, Korea is relatively undiscovered by foreign tourists, and just getting around and experiencing the markets, food, and culture can make for a good trip. Adventure #1: Noryangjin Fish Market. Great success! I transitioned my two guests into Korean life by starting with a night out in the Itaewon district, which I live very close to. Itaewon is probably the least Korean-feeling place in Korea, so I figured this would make for a good transition. On the weekend, we stepped up my guests' cultural immersion quickly. I took them to the Noryangjin Fish Market for lunch and ordered a fresh seafood meal directly from one of the fish vendors on the market floor. This was a bit of a leap of faith for me as I had only visited one previous time and a Korean had done all the ordering. My Korean language skills are still poor but I managed to acquire some fresh crabs, clams, prawns, and a flat fish which may have been flounder. The middle-aged Korean lady from the fish stand, grateful for my business, walked the three of us to her favorite restaurant, where we sat on the floor while the restaurant staff prepared our meal for us. Prawns were grilled, crabs were boiled, the flesh of the flat fish was served sashimi-style and the head of the fish was mixed into a bean sprout stew. A very Korean meal and my sister loved it! In the evening, my sister had booked tickets for the Nanta cooking show in the Hongdae district. Afterwards, I went for another cultural meal that even I had yet to experience -- gopchang, aka beef intestine! When I also ordered a bottle of soju to go with my sister really started getting nervous, but after trying the intestine she admitted it wasn't that bad. Sort of like a chewy sausage. If you can avoid thinking about what you are eating then the taste was pretty good. Allegedly the intestine is full of nutrients and good for your complexion, though I'm skeptical about most Korean medical claims. 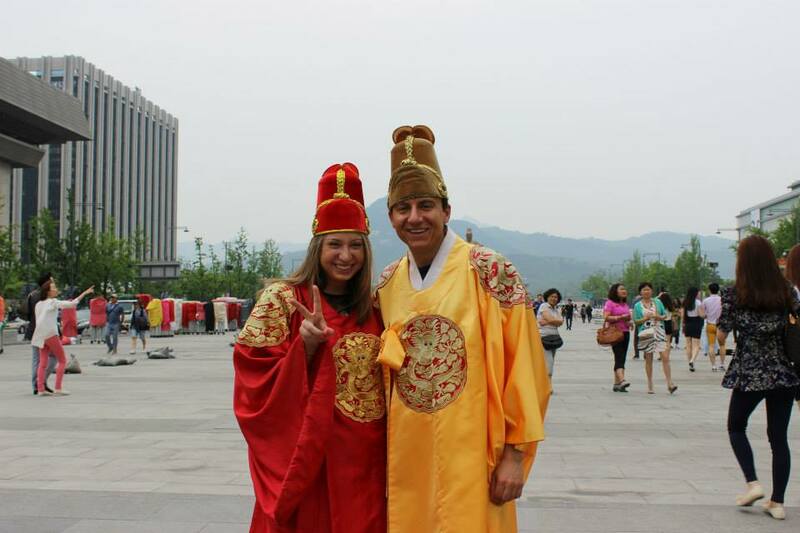 We saw some of the major tourist attractions as well – Gwanghwamun Square (where you can take pictures wearing Korean nobles' clothes – for free! ), Garosu-gil, Insa-dong, Myeong-dong, and Namsan Tower. During the week following, my sister and her friend battled rain in Seoul but were able to check some boxes that even I haven't been able to experience, such as viewing a 4D movie and visiting a jjimjilbang (Korean spa). As two attractive, young, Western women, my sister and her friend did attract some attention from the locals, which surprised me as I have only had few people stare at me in Korea. After one week of exhilarating and eye-opening experiences, my sister and her friend returned to Incheon Airport and flew back home (via Dubai, where they had another set of cultural adventures). I was a little surprised that the two of them hadn't explored more of Korea outside of Seoul – Jeju, Busan, and the DMZ are probably the most common things to do. I was also surprised that they had decided not to visit more of Asia ... why they chose to fly halfway around the world and not stop by Japan or Hong Kong seemed foolish. But you cannot tell other people how to enjoy their vacations. My sister and her friend had a great time nonetheless. My sister's visit also served as a reminder for how far I have come from the naive adventurer I was when I landed in Seoul for the first time 10 months ago. Even with my broken language skills my sister thought I was a master in directing taxis and ordering food in restaurants. I see how far I have come in eating with chopsticks and understanding the basics of Korean culture. I'm amused, but not shocked, by many of the things I see around me most days. Just living in a country where people like me are an extreme minority feels rather normal to me now but was rather shocking to my sister. 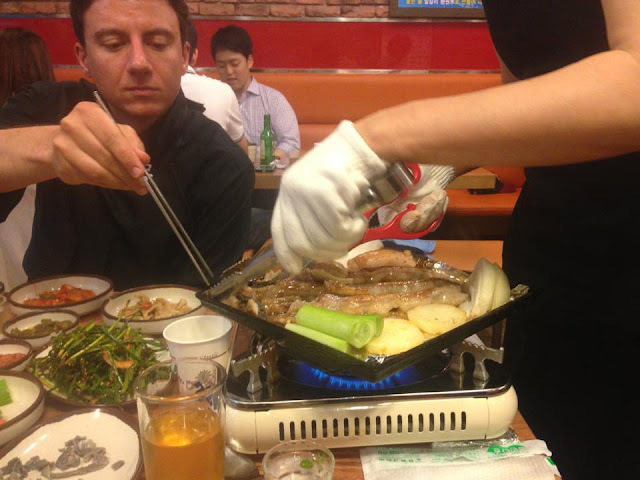 I recalled how strange it was for me too when I first arrived in Seoul. After my sister's successful visit, my mother is now talking about making the trip as well. She also has never visited Asia and is markedly less adventurous than my sister ... this could be interesting!! !